White Plains, New Rochelle, and Westchester County have many roads to drive on, and one way to enjoy those drives is in a sports luxury sedan. One vehicle that blends an athletic performance with a sophisticated design is the BMW 328d, but would it satisfy your driving needs? To help answer that question, our team at BMW of Westchester has created this 2018 BMW 328d review. We’ll give you a detailed look at this vehicle, so you can make an informed decision. Read all about it below and don’t hesitate to contact us if you have any questions. View our complete 2018 BMW 328d inventory online. The BMW 328d comes with a 2.0L 4-cylinder engine that delivers 180 horsepower and 280 lb-ft of torque. It’s mated to an 8-speed STEPTRONIC Sport Automatic Transmission with automatic Sport and Manual shift modes and steering wheel–mounted paddle shifters. This way, you’ll be in complete control of the smooth and athletic ride. And with the Driving Dynamics Control system, you can choose from four settings to further customize your driving experience: ECO PRO, COMFORT, SPORT, and SPORT+. The 328d comes standard with SensaTec upholstery and has an available Dakota leather interior. It also comes standard with an Anthracite headliner and a Fineline Anthracite Wood trim with Pearl Gloss Chrome highlight. To get in the perfect position behind the wheel, the 328d comes with 10-way power front sport seats with driver memory for both the seating position and exterior mirrors. The front seats can be heated as well, so you can stay nice and cozy on colder nights. The 2018 BMW 328d interior offers plenty of space for five passengers. In front, there are 40.3 inches of headroom and 42 inches of legroom. And in back, there are 37.7 inches of headroom and 35.1 inches of legroom. This vehicle has plenty of high-tech features to make your drives more enjoyable. It comes standard with a CD/MP3 player, a 9-speaker sound system, and HD Radio™. It also has an available BMW Navigation system that comes with advanced real-time traffic information. This gives you the optimum route to your destination, so you’re sure to arrive on time. There’s also an available Head-Up Display that projects important info like navigation and speed directly onto the windshield. 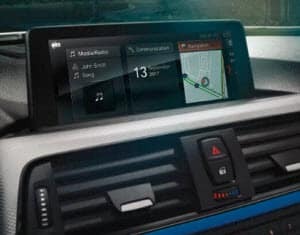 And the navigation system works in tandem with the available BMW Connected app. From your smartphone, the app can load your destination from your calendar, sync it to the BMW Navigation, and let you know when it’s time to leave. The BMW 328d is an impressive sedan with lots of features. But if you need help deciding if it’s right for you, you can always check it out in person. If you live in the White Plains, New Rochelle, or Westchester County area and want to get behind the wheel of the 2018 328d, then schedule a test drive at BMW of Westchester. We’ve helped many drivers in the area find their ideal vehicle, and we look forward to doing the same for you.